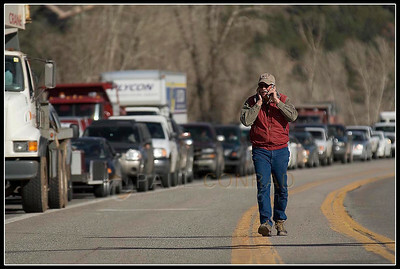 © Paul Conrad/Pablo Conrad Photography With the afternoon traffic backing up behind him, Monroe Summers of Basalt Colo., walks towards the El Jebel light after parking his truck and cattle trailer a quarter mile back on Highway 82. 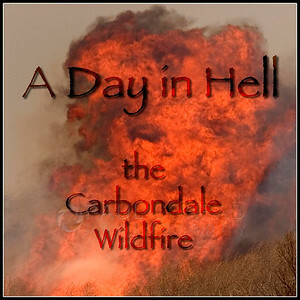 Summers said he was concerned about his cattle that were in a lot where the wildland fire was burning. 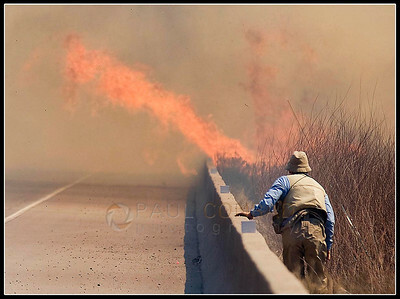 © Paul Conrad/Pablo Conrad Photography A man watches the encroaching flames after stopping on Highway 82 one mile east of Ranch at Roaring Fork. 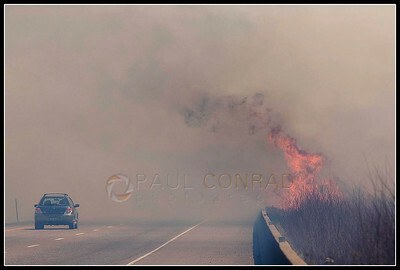 © Paul Conrad/Pablo Conrad Photography Despite the erupting flames, drivers continue on into heavy smoke. 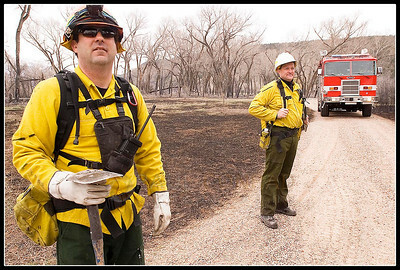 © Paul Conrad/Pablo Conrad Photography Aspen volunteer firefighters Chris Olsen, left, and Mike Lyons check for hot spots in the Roaring Fork Preserve off County Road 100 near Carbondale. 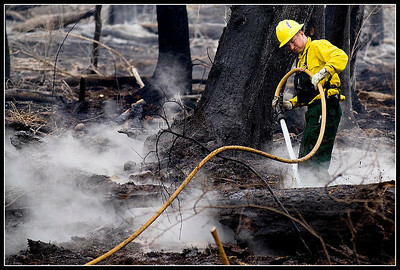 With the 100 Road fire nearly contained, fire fighters worked to extiquish hot spots and fall burned trees. 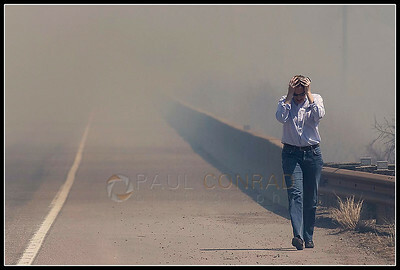 © Paul Conrad/Pablo Conrad Photography Adrian Rowberry of Carbondale, Colo., walks in dismay after watching an encroaching wildland fire threaten her neighborhood along Highway 82. 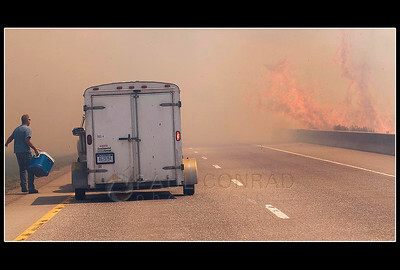 © Paul Conrad/Pablo Conrad Photography Fly fisherman Tom Greenup of Wisc., watches flames encroach upon Highway 82 as he and two others barely escape the flames near Carbondale, Colo. His friend Larry Garfinkle of Thousand Oaks, Calif., was severely burned while escaping. 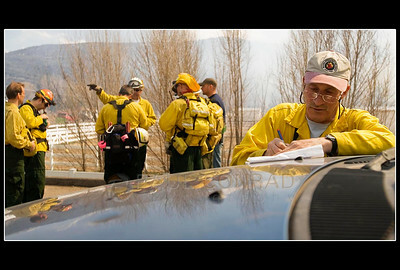 © Paul Conrad/Pablo Conrad Photography Fire encroaches on a home in the Ranch at Roaring Fork subdivision in Carbondale, Colo.
© Paul Conrad/Pablo Conrad Photography Aspen volunteer fire fighter Ron Baar, left, takes notes as other Aspen fire fighters prepare to help battle the fire. 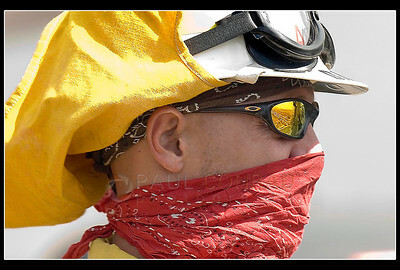 © Paul Conrad/Pablo Conrad Photography Aspen volunteer fire fighter Frank Bauer watches the command center at the fire as it nears Aspen Equestrian Estates. 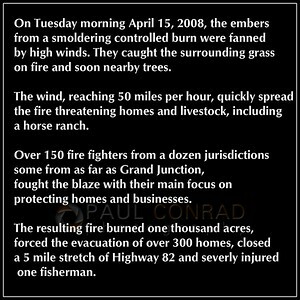 © Paul Conrad/Pablo Conrad Photography After jumping Highway 82, flames erupt in a grove of cottonwood. 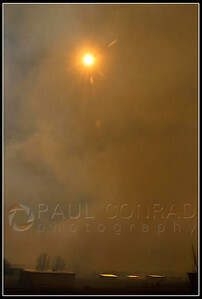 © Paul Conrad/Pablo Conrad Photography Heavy smoke fills the sky and nearly blocks out the sun. 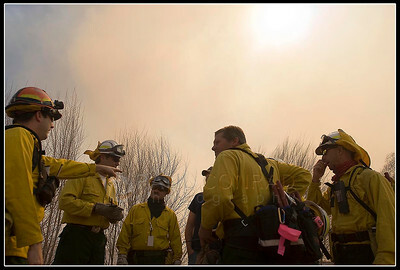 © Paul Conrad/Pablo Conrad Photography Aspen volunteer fire fighters gather at the incident command center at Catherine Store. 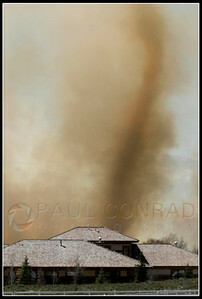 © Paul Conrad/Pablo Conrad Photography A smoke tornado rises over the Aspen Equestrian Estates. 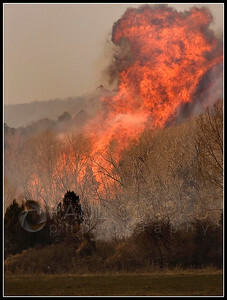 Large fires are know to create their own weather due to the intense heat they create. 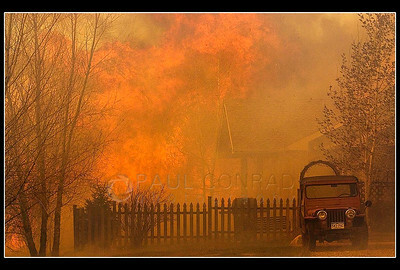 © Paul Conrad/Pablo Conrad Photography Two pedestrians walk down County Road 100 near Equestrian Way during the 100 Road brush fire east of Carbondale, Colo.
© Paul Conrad/Pablo Conrad Photography A fire fighter atop a brush truck sprays a spot fire near the Blue Creek subdivision west of Carbondale, Colo. High winds carried hot embers as far as a hundred yards spreading the fire quickly over a thousand acres. 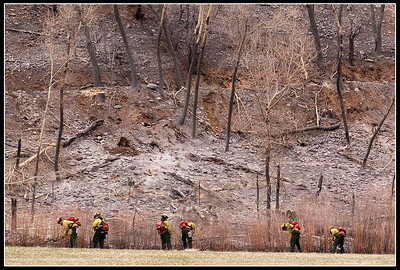 © Paul Conrad/Pablo Conrad Photography Fire fighters clean hot spots just north of Highway 82 near Catherine Store. 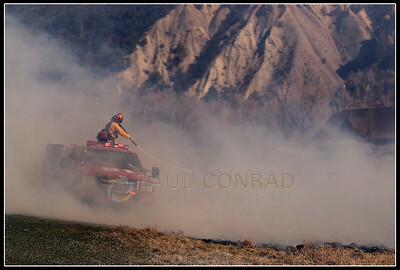 © Paul Conrad/Pablo Conrad Photography A Glenwood Springs fire fighter douses smoldering embers from the 100 Road fire on Equestrian Way in the Aspen Equestrian Estates subdivision. 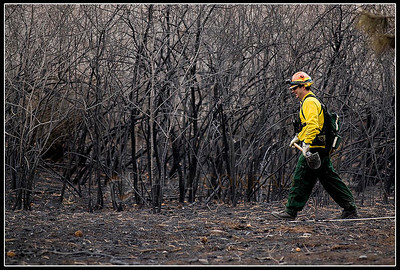 © Paul Conrad/Pablo Conrad Photography Aspen volunteer fire fighter Chris Olsen walks among burned brush while searching for hotspots in the Roaring Fork Preserve subdivision along Catherine Store Road. 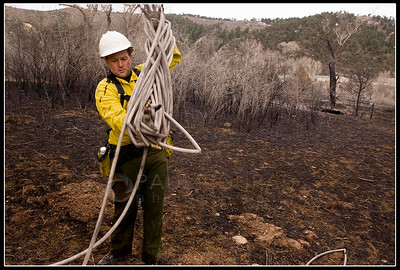 © Paul Conrad/Pablo Conrad Photography Aspen volunteer fire fighter Mike Lyons winds up a hose after dousing a hot spot in the Roaring Fork Preserve subdivision. 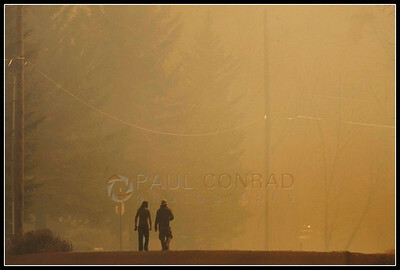 © Paul Conrad/Pablo Conrad Photography Larry Garfinkel, 61, of Thousand Oaks, Calif, is comforted by his wife of 26 years, Angie, as he recounts his survival during the County Road 100 wildfire at Valley View Hospital in Glenwood Springs, Colo. Garfinkel was fishing the Roaring Fork River near the Ranch at Roaring Fork housing complex with friends Tom Greenup and Chuck Hyatt when the flames of the fire overtook him and was burned while escaping. 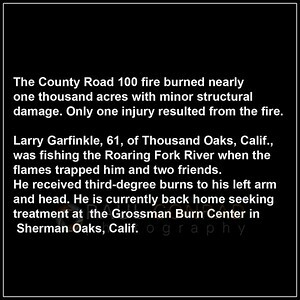 Garfinkel received third-degree burns on his left arm and back of his head. 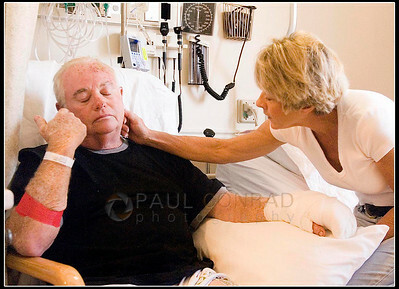 Doctors took a skin graft from his left thigh to fix his left hand and forearm. 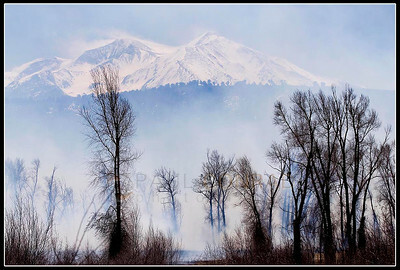 © Paul Conrad/Pablo Conrad Photography With Mount Sopris looming over, heavy smoke filters through a grove of cottonwoods along the Roaring Fork River near Carbondale, Colo.